Modern clubhouse facilities including changing rooms, bars, restaurants, lounges, spa and leisure facilities and a fully stocked pro shop. Golf facilities include practice areas and driving range along with equipment hire. Arcos Gardens Golf and Country Club is a low density residential community in Arcos de la Frontera, Cadiz which is surrounded by rolling hills, winding rivers and its own 18 hole golf course. Arcos Gardens Golf Course was designed by Landmark (creators of PGA West Palm Beach Polo and the ocena Course at Kiawah Island) and is a 7,400 yard long, Par 72 monster from the back tees. However, the use of 5 -6 tee positions on every hole means the course can be enjoyed just as much by the less gifted golfer. The course offers wide fairways but the integration of numerous water hazards plus strategically placed bunkers mean the course requires thought about each shot. 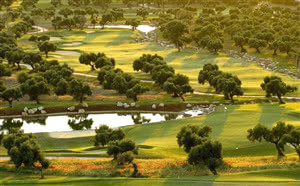 Surrounded by a vast array of wildlife and plants, with views across the countryside to surrounding lakes and the cliff-top town of Arcos de la Frontera, a round of golf at Arcos Gardens is a true pleasure for all players.